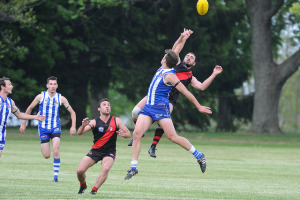 The Toronto Dingos battled through three hard-fought quarters against the Etobicoke Kangaroos this past Friday, only to let things slip away in the fourth and dropping the match by 3-goal margin. 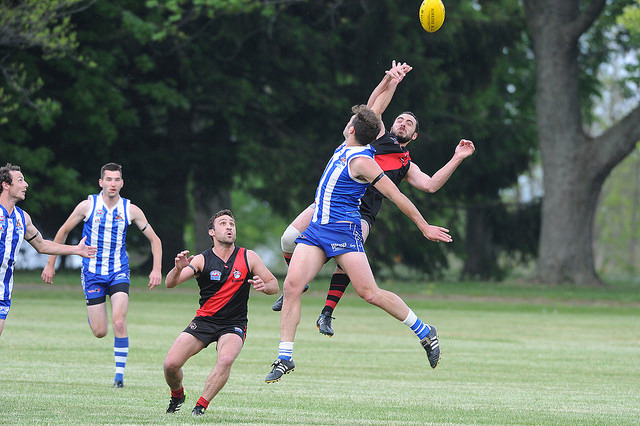 Under a gorgeous sunset that is typical of the Friday night clashes, the two teams traded leads back and forth evenly through the first three quarters, with the Roos building a small lead in the first and the Red and Black romping back in the second. By the time the fourth quarter hit, the score was 6.8-44 to 6.6-42 in favour of Etobicoke, and both teams were feeling the wear and tear of match. Unfortunately for the Red and Black, the Roos were able to get some seperation by playing some gritty, smart football - and a few unfortunately timed 50-metre penalties. Once again leading the effort up front for the Dingos, Wade Edwards and Mitch 'Fridge' Stewart bagged three and two goals respectively, while BOG Tom Humphries popped in two of his own. The match was the first of what will become an annual tradition between the two clubs honouring a longtime Roos supporter Ken Gray who recently passed, named the Ken Gray Memorial Cup. The Dingos were honoured to be a part of this inaugural event, and offer congrats to Tom Humphries who was awarded the first BOG title. The Dingos travel to U of T Scarborough field next week to take on the reigning GF champions, the Broadview Hawks.